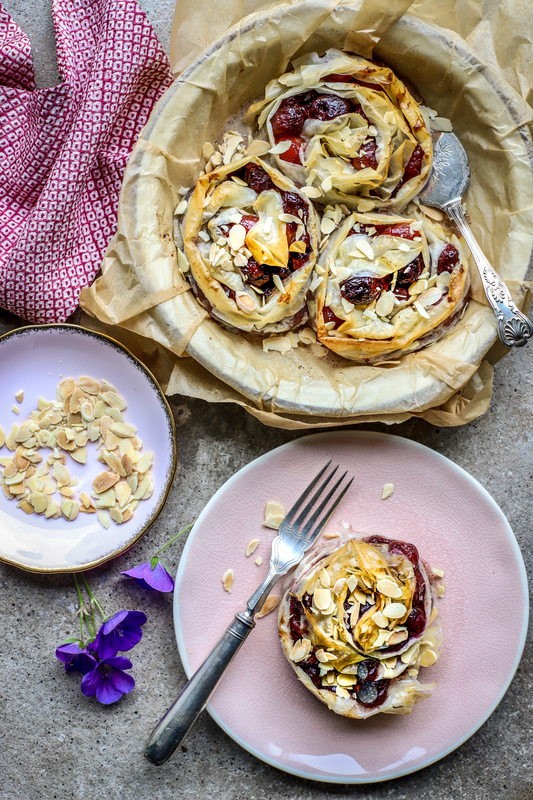 Easy Cherry and Cream Cheese Ruffle Hand Pies – make with a simple cherry sauce nestled with (vegan) cream cheese in rosettes of crunchy phyllo pastry. A healthy-ish sweet treat for dessert. This recipe could not be easier. I urge you to try this with the last of this year’s cherries, or with incoming season’s bursting-sweet plums or juicy apples. It’s a heavenly marriage of crispy phyllo, lemony-vanilla vegan (or not) cream cheese, and your own homemade – and super easy – homemade cherry pie filling. I’ve loosely modelled the look and feel of this easy dessert recipe on various ruffle pies I’ve seen when researching how to make hand pies with a difference. I liked the unmade bed look of this style of baking. The ruffle pie seems to have its origins in Greece, where a sweetened milk and egg mixture is poured over artfully crumpled folds of phyllo pastry and baked to a gorgeous pudding texture. This truly sounds delicious and I plan on making one of these rich Greek custard pies someday soon – and posting the results over on my Instagram. For now, with an eye to highlighting fruit not phyllo, I wanted to capture the last of this year’s English cherries in little hand pies. Not ones where we labour over making homemade pastry. Or even rolling out and faffing with the bought stuff. I thought it might be fun to grab one of the various packets of phyllo that I seem to collect and fill strips with a batch of homemade cherry pie filling – first used to serve with my recently published Probiotic Pancakes. I also wanted to hark back to the “Danish pastries” (no Dane would lay claim to these 1970s US ones, I’m quite sure) I grew up enjoying, ones with lemony-vanilla cream cheese topped with a dod of over-sweetened, commercial fruit goop. I always loved the cream cheese bit best, of course. You may use this technique – and indeed improve upon it as I haven’t seen it done this way elsewhere – with fruit or vegetables. I plan on a savoury one in the near future. So, for each hand pie, take a length of phyllo cut it in half widthways and fold one piece in half lengthways so that you have a long double layer; run a knife through the fold to split it. Take your cream cheese filling and spread some along the middle length, topped with the thick cherry sauce (see image). Fold one side into the middle and fold it back onto itself, like you are making a paper fan (see image). Do the other side. Now gently coil it to make a ruffled crown shape, tucking in the end so that it doesn’t stick out and unravel. That’s pretty much it! Depending on the size of your pan you can make anywhere from three (like I did) to over a dozen. I also have shown one in a small skillet (below) to show that you can make individual ones. With this recipe you don’t need any support from a pan, so you can do these little phyllo hand pies on a baking sheet, in a dish or in a skillet. Preheat the oven to 180 fan/ 200C/400F. Line a baking tray, baking dish or skillet with parchment paper. In a small bowl mix the cream cheese, lemon juice and zest, vanilla powder and sugar if using. Take each piece of phyllo, cut each in half widthways. Working with one piece at a time, keep the unused dough under a lightly damp tea towel. Fold one piece in half lengthways so that you have a double layer; take a small knife and split the fold. Take your cream cheese filling and spread some along the middle length, then top with some thick cherry sauce. Fold one side into the middle and fold it back onto itself, like you are making a paper fan. Do the other side. Now gently coil it to make a ruffled crown shape, tucking in the end so that it doesn’t stick out and unravel. Place the pastry onto a parchment paper-lined baking tray, dish or skillet. Carry on with the other phyllo until you have four rosettes of cherry and cheese-filled pastry. Brush with melted butter and put in the preheated oven for 25-30 minutes, or until the bottom of the pastry is crisped. Serve warm with the almonds scattered over and any finishing sugar. Wow! I need this in my life. I love the additions of vegan alternative ingredients! Thanks so much, Elaine. I like that you appreciate my “rustic styling”. Others would say big old mess, I’m sure! Thats so clever cos they look super fancy but great to see they are easy to make. I love filo and I can just imagine how nice the juicy cherries will be next to the flakey pastry. Lovely.